- Oh c'mon! For now appreciate the sunset and enjoy the view! 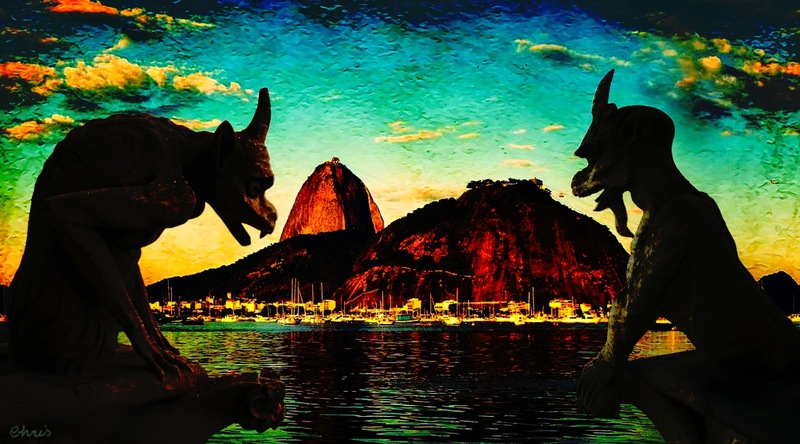 The challenge in Three Muses is SILHOUETTE and it has occurred to me that it would be fun to give the Notre-Dame’s gargoyles a vacation in Rio. Unfortunately one of them is too fearful to enjoy traveling. I love your French Gargoyles Chris they are hilarious and remind me of when my French relatives visit...thanks for the laugh. Rio is in for a shock!! These fellows look fearsome. Clever and evocative piece, Chris! Interesting take on the theme, Christine, with a touch of humour! i think they found a great place here (paris is overrated;)) - so very clever! The grass is always greener on the other side which is something the gargoyle needs to learn!! This is a wonderful piece, Chris. I love the way you put so much thought into your pictures as well as some seriously good artwork. Magnificent piece of art, Chris. Love this awesome and beautiful creation. Love your unique and wonderful take on the challenge, Chris.